Canadian-based author, Gayle Siebert, has released her debut fiction novel, “The Pillerton Secret,” which follows the story of protagonist Kathy Klein as she ventures back to her hometown, uncovering secrets that quickly put her life in jeopardy. Set in a fictional Saskatchewan town called Pillerton, Kathy moves into her childhood home following the death of her estranged mother. Hoping to dispute the gifting of the property to a cult known as The Children of Noah, she unravels dangerous secrets buried in her century-old house as she becomes the target of the cult and corrupt town of Pillerton. As Kathy navigates through the unexpected hurdles that come her way, the story provides an empowering message to women through its heroine to stay strong and overcome adversity. A suspenseful thriller, “The Pillerton Secret” will keep readers in anticipation of what will unfold next throughout this entertaining book. Gayle Siebert has always been crazy about horses, reading and writing. She grew up in Saskatchewan and Alberta, and now lives on a small horse farm on Vancouver Island, British Columbia. Of the dozens of short stories and novellas Siebert’s written, one had characters that continued to emerge. 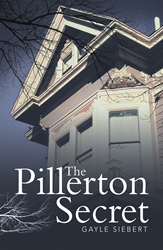 “The Pillerton Secret” is the result. This is Siebert’s debut novel, but she’s completed the first draft of a second thriller, and is working on an outline for a third.